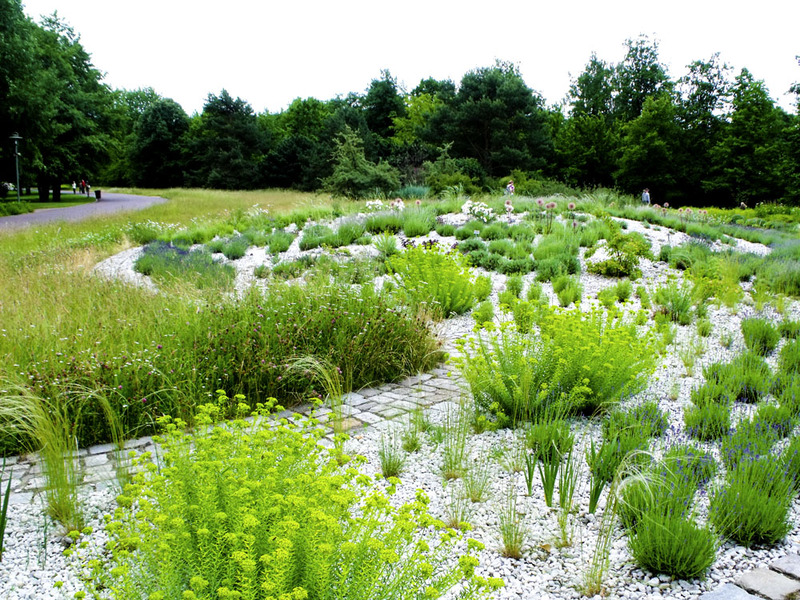 Over the past couple of weeks we have been to the Botanischer Garten, and the Gärten der Welt in Marzahn. 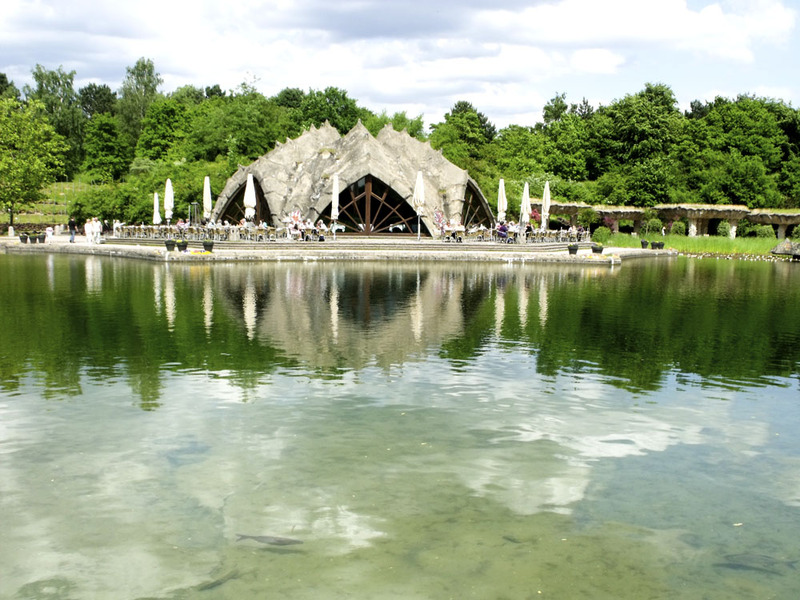 This weekend, in markedly less sunny weather, we visited the Britzer Garten in SE Berlin. The Britzer Garten was created for the Bundesgartenschau (Federal Garden Show) of 1985. These Bundesgartenschauen - unfortunately abbreviated to BUGA - have occurred bi-annually since the first in Hannover in 1951. Their initial purpose was to rebuild city parks destroyed by the war, and to encourage visitors to areas in West Germany suffering economically, meanwhile promoting horticulture and horticultural architecture. They continue to this day, and in fact there will be one in Berlin in 2017 on the large open space left by the closure of Tempelhof Airport. There is a bit of controversy about whether national taxes should still go to fund these creations, but if anywhere is in need of a bit of landscaping, it is Tempelhof (it's like a bleeding airfield for chrissakes!). The Britzer Garten is (Überraschung!) 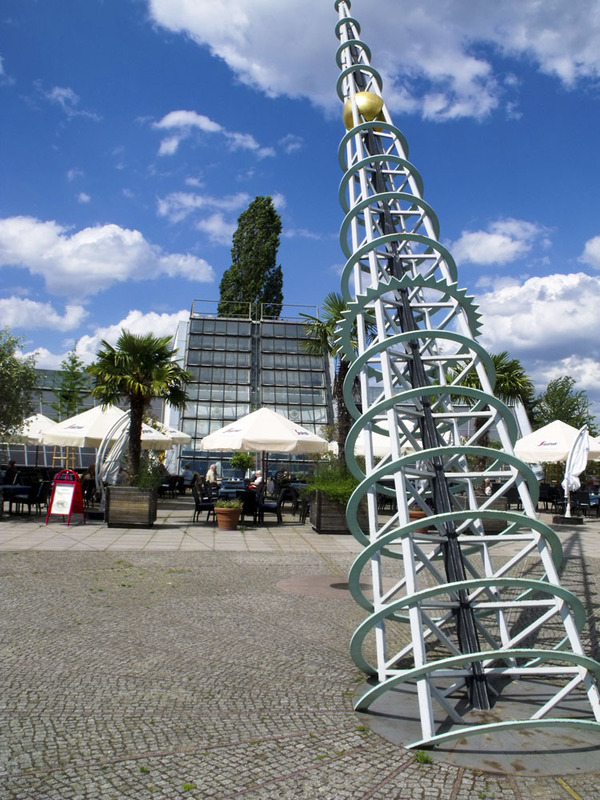 located in the Britz quarter of Neuköln. This isn't the area where ex-pat Brits live, but is actually the name of a village that was swallowed up by Berlin as part of the Greater Berlin Act of 1920. The village feel has long-since gone, and this is an area of high-rise Plattenbau, although in contrast to Marzahn these are of West German FDR construction. It can be a bit of an adventure to get to, and we found the best way for us involved the S2 station at Buckow and a couple of bus-rides. The garden is pleasant enough. 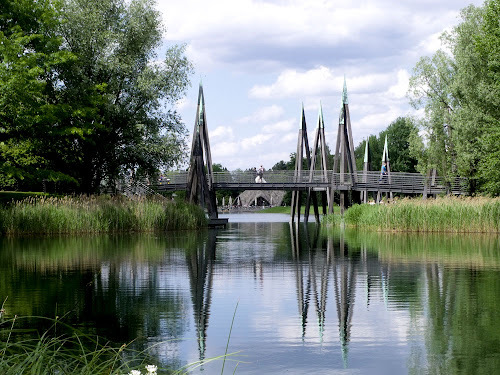 It is centred around a large lake with an architecturally interesting restaurant - Café am See - that looks like Antoni Gaudi was an influence (it was actually dsigned by Engelbert Kremser). 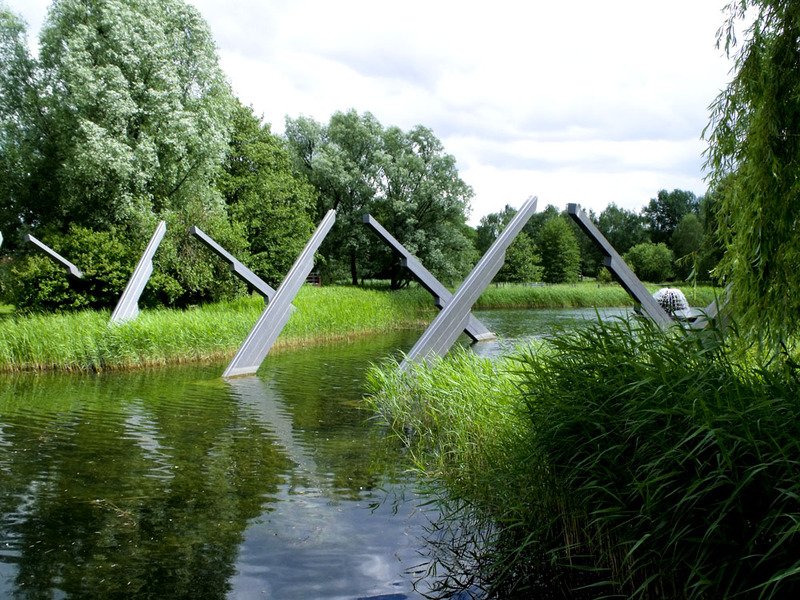 The lakes are well-stocked with fish and include a bay designed for sailing model boats. There were some magnificent specimens on display when we visited, indicating these aren't just toys for boys. The Britzer Garten did seem more like a recreational space rather than somewhere to admire or learn about horticulture. There are large areas for throwing a Frisbee around (though no dogs allowed!) or having a picnic, or for just lounging and sun-bathing. But there is no cycling, as unfortunately bikes are also 'nicht gestattet', and it would have been nice if full-sized canoes and rowing boats were allowed on the lake. There are plenty of Cafés and such-like in which to spend an afternoon chatting with friends and drinking a Bier or two, or just reading a book. Here is a photo of the reading café in the Karl Foerster Pavillion. The architecture and sculpture in Britzer Garten is all straight out of the Eighties, which isn't to disparage it for being uninteresting. The Kalenderplatz Bistro is located within what is (according to the literature) supposedly the largest sundial in Europe. As a former employee of Ashfield District Council, I would argue that the sundial in Sutton-in-Ashfield marketplace is in fact slightly bigger, though not so futuristic looking. It is all rather Plan Nine From Outer Space, and you wonder what alien fleet of UFO's they are expecting to fire upon. Sundial gnomon or ray-gun - you decide. Kalendarplatz is also ringed by some scary-looking, sharp, incomplete arches that might have supported a monorail for Logan's Run or something. Sculpture? Incomplete Monorail? Nice fountain in the background though. Unusually for Flatlander Berlin, the park incorporates a number of (artificial) hills that do give a 3rd dimension to the landscape. One of these even has sheep! (sorry for getting excited - sheep are such a rarity in Brandenburg/Berlin that the only place you see them is in Berlin Zoo). 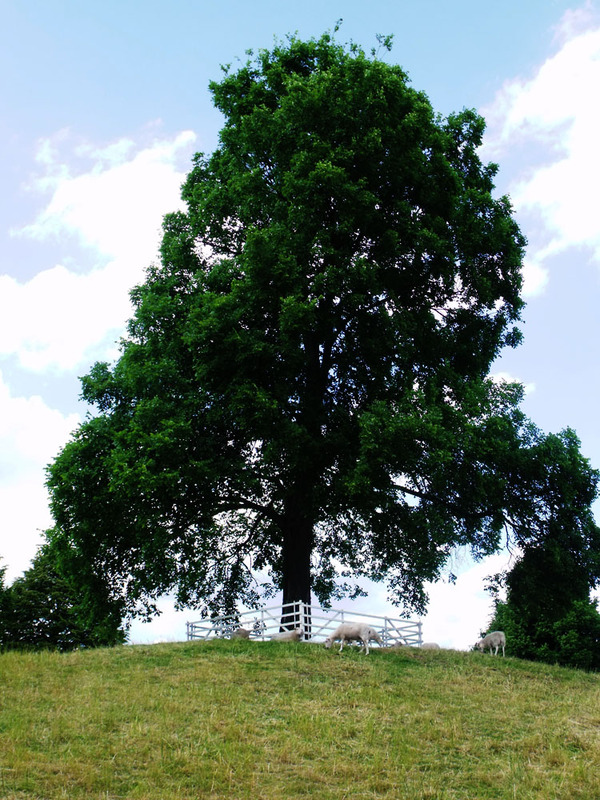 This is the one and only resemblance of Britzer Garten to the Gardens at Chatsworth House, Derbyshire. The park is fairly large with, let's be honest, not a lot between places of interest. 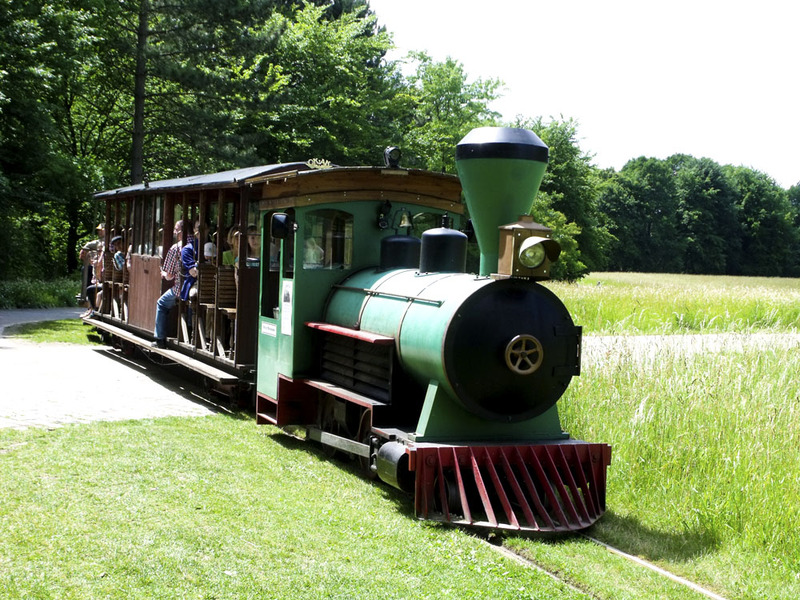 If it all gets a bit wearisome on the feet, then there is a small-scale railway that can take you around the garden. What you might have noticed lacking from my photos is any indication of actual flowers in this garden. That's not to be taken that there aren't very many, just that they were not particularly predominant or stunning. There is reportedly a very good tulip display from mid-April to mid-May, and a 'fire' of dahlias in late Summer. The floral event when we visited was supposedly the 'Zauberbluten' of rhododendrons, but unfortunately most of the flowers had been and gone. This was particularly annoying because we had paid 3€ entrance each instead of 2€ because of the special 'Zaubenblüten im Rhododendronhain' display. We was robbed! 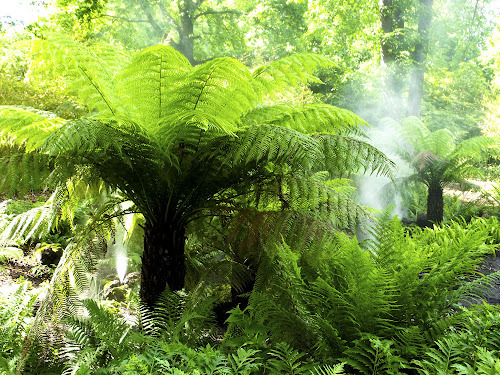 However, we did discover a mini-rainforest hidden amongst the rhododendron bushes, and just as we were admiring the ferns, a delivery of fine mist was turned on. 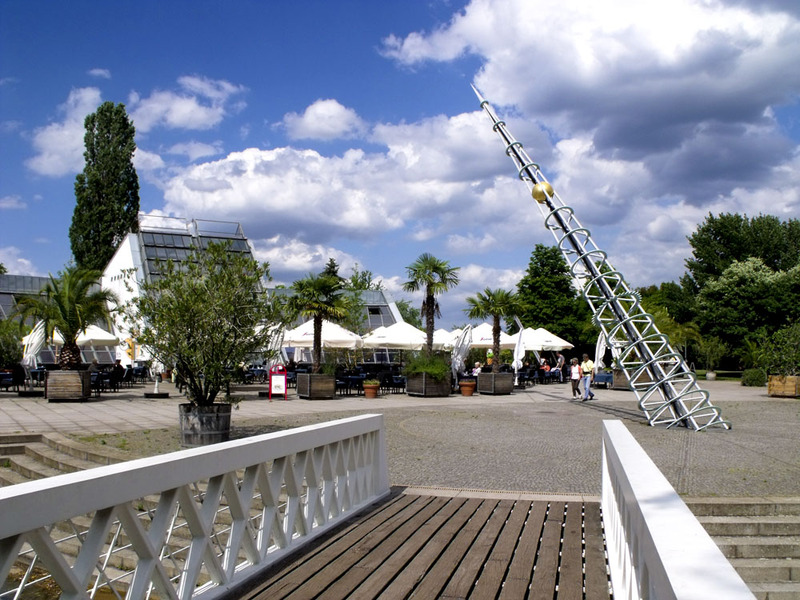 In conclusion, the Britzer Garten is a pleasant space to relax and spend a Sunday afternoon. It is clean and well maintained, and has a fair choice of places to eat or drink. The architecture is interesting, if dated. The flower beds are well-tended and weed-free, but not spectacular. It is not surprising that whilst die Gärten der Welt were packed, there were very few people wandering around the Britzer Garten, though admittedly the weather was duller. By the way, Britzer and Gärten der Welt are owned by the same GrünBerlin GmbH, and a Jahreskarte (yearly ticket) is valid for both. Would we bother to travel out to the Britzer Garten again? Probably not. 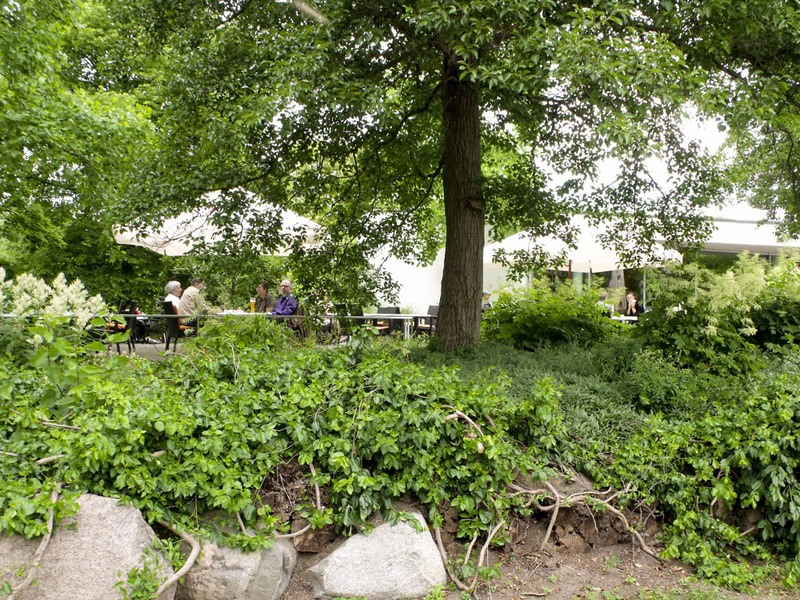 Consider that the centrally located Tiergarten is nearly two and a half times larger, and also has lakes and much better flower gardens (including spectacular rhododendrons) that you can enjoy for free. Alright, the Tiergarten doesn't have a train you can ride on, or sheep, and there is always the risk of wandering into a nudist area, but in a comparison it wins hands down. So what we have learned so far in our horticultural explorations? For imaginatively themed garden designs, visit die Gärten der Welt. For exotic plants visit the Botanischer Garten. 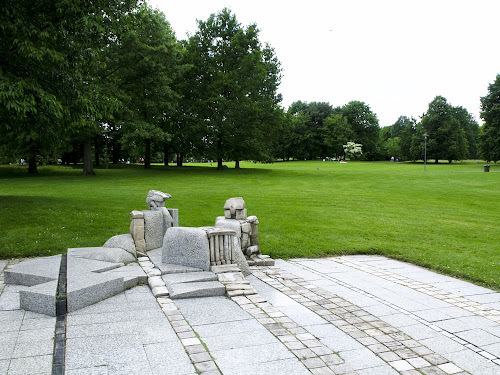 For somewhere to play around with a Frisbee (especially if you have a dog) or relax in a Biergarten beside a lake, you need go no further than the Tiergarten. And I'll be BUGA'd if I'll travel out to Britzer Garten again unless I hear the tulips are really spectacular. "and there is always the risk of wandering into a nudist area," :) and this ? I like " but if anywhere is in need of a bit of landscaping, it is Tempelhof (it's like a bleeding airfield for chrissakes!)." The tulips are spectacular, as are the Dahlias. I was amazed at how good the tulip display was. Not quite Keukenhof, but wonderful. I don't have very many shots of the flowers, but you can see a few. G in Berlin: firstly, nice blog! Secondly, the tulips do look spectacular. I may be tempted back next Spring (or later in the year for the dahlias).